« It’s All About That “Baste” Thanksgiving Eve Party! Come out Thanksgiving morning to mark the 41st running of Richmond’s Turkey Trot 10K and help Feed More! 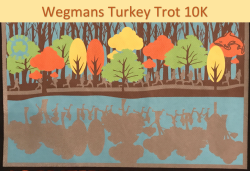 Join Richmond Road Runners Club and the race’s sponsor Wegmans for the 10K road race and a kids fun run in and around the University of Richmond. Runners and volunteers are encouraged to bring jars of peanut butter and/or cans of tuna on race day. All food donations will be delivered to Feed More and distributed through our network of nearly 300 agencies to our neighbors across Central Virginia in need.